weADAPT brings together a global climate change network to facilitate learning, communication and policy change. Our goal was to help improve the weADAPT wiki platform and grow their network further. We achieved this through in-depth research, having a clear content strategy and using design to clarify how the complex and varied information was presented to the user. weADAPT is the first truly collaborative platform of its kind in the field of climate adaptation, in that it is developed and maintained by many global and local organisations working on adaptation. It is hosted by the Oxford Centre of the Stockholm Environment Institute (SEI), and is the result of collaborations with organisations such as IIED, Climate Knowledge Brokers group, CDKN, UNEP, UNITAR, CIFOR, University of Cape Town, Oxfam and Google.org. 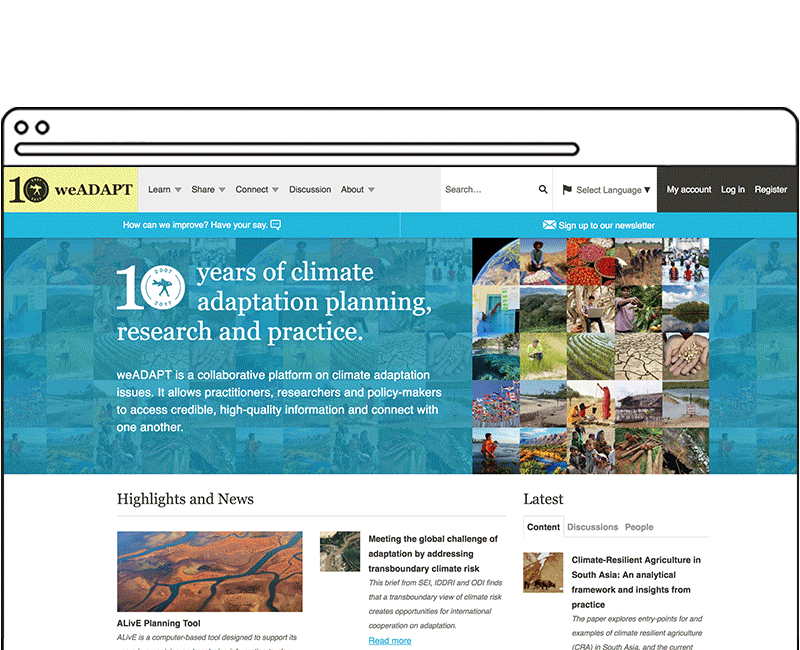 We were tasked with rebuilding the weADAPT website from the ground up, whilst improving the design and user interface on desktop, mobile and tablet. This meant the migration of thousands of users and articles into a brand new, more clearly ordered website. An extended research phase enabled us to decide the hierarchy of the information and how this should be represented in the design. We also rebuilt and redesigned the advanced functionality that weADAPT already used, such as user content submission and subscription, interactive maps (the "Adaptation Layer") and its automatic content tagging system. All of this work resulted in a website that is easier to use, navigate, and an interface that connects its users more strongly than before. A core goal was to improve the navigation and user flow around the site. In order to this we developed a clear sitemap and an icon library as a visual sign-posting tool for the user. Because weADAPT includes a wide range of multimedia content, it was essential that the design be very flexible. Therefore we focussed on developing a design 'style guide' composed of typography, subtle graphics and versatile structure, which allows the design to work around the content. The Adaptation Layer is an interactive map feature, built for the previous site, that required translating to the new site and integrating with Drupal. The new Adaptation Layer integrates smoothly with the new site, and allows content to be plotted onto a searchable map. It also pulls in live climate station data from around the world. We have since developed the weADAPT platform to allow partner microsites to be built powered by the same technology. An example is the Energy Adaptation Map, which is powered by the same platform, but we designed as a fully independent site with unique URL and website design to match the partner client's needs. weADAPT has thousands of pieces of content which, are laid out in a clear interactive 'wiki' style way. They are linked together through keywords, themes and networks. The Adaptation Layer interactive map works smoothly on all devices. The weADAPT website is used regularly by researchers and stakeholders, many of whom travel often, and access the site whilst "on the go". Therefore a core goal was to increase usability for mobile and tablet users. Since we launched the new responsive website, mobile visitors have increased by 43% and tablet visitors increased by 53%.